Here’s a little card that was one of the make and takes we did at a workshop in January. The hostess had asked that I do something the Petite Petals and matching punch and scallop embossing folder. You can’t beat a pink and green color combo, put it all together and this is what I came up with! Pink Pirouette – 3 5/8 x 4 7/8, run through, Scallop Embossing Folder, layer on Primrose Petals 3 3/4 x 5. Add to card front. Whisper White – 2 x 4 1/4. Punch one end using the Scallop Tag Topper and corner round the bottom ends. Stamp greeting using Basic Grey. Run through the Needlepoint Embossing Folder. Add Pear Pizzazz Chevron Ribbon throw tag hole and tie using Whisper White Baker’s Twine. Add to card front using dimensionals. 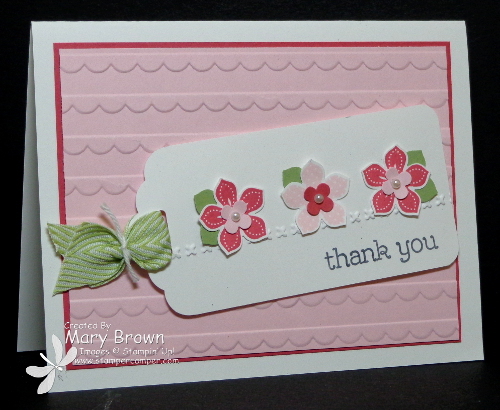 Stamp the one Petite Petals flower two times using Primrose Petals and the other one time using Pink Pirouette. Punch out using matching punch. Add 4 petal bitty punch flower – two in Pink Pirouette, one in Primrose Petals. Use Petite Petals punch and Pear Pizzazz to make the leaves. Add flowers to the tag. Add small pearls to the centers of the flowers to finish it off. This entry was posted in Spring Mini and tagged Petite Petals. Bookmark the permalink.